Celebrate the holidays in Rehoboth Beach, DE where the spirit of the city comes alive. The season kicks off with Winter WonderFEST, featuring dozens of light displays and a grand Christmas Village. Create new traditions while enjoying fun holiday events, festivals, music and local cuisine. Enjoy Thanksgiving Dinner with the family, see the twinkling Christmas lights, shop for that perfect gift and celebrate the New Year. 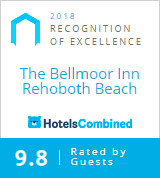 Book our Rehoboth Beach, DE holiday specials at The Bellmoor Inn and Spa and make memories to last a lifetime.